Heat a very large skillet over medium high heat until hot. Add oil, then the bacon to the skillet, and reduce heat to medium. Fry bacon 2 to 3 minutes or until the fat begins to melt. Add the onions to the skillet, and continue to sauté until the bacon is cooked, and the onions have begun to caramelize, about 5 to 8 minutes. Add garlic and sauté 2 to 3 minutes. Peel, core, and chop the Kumato® brand Tomatoes, and add them to the skillet. Add the tomato paste, whisking to dissolve. Increase the heat to medium high and simmer the tomatoes, stirring gently and frequently, to release their liquid. Simmer 10 to 15 minutes, or until tomato pieces have lost their shape, and the mixture appears to be cooked down and becomes thick and chunky. Remove skillet from heat and immediately stir in the herbs and the spices to taste. Prepare the tortellini per package directions and portion into pasta bowls. 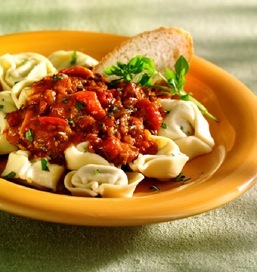 Spoon hot tomato sauce over the cooked tortellini and sprinkle with shredded Parmesan. Add an additional sprinkle of minced green herb over the top if desired. Serve immediately. To quickly peel tomatoes, follow this easy step. Cut an “x” on the bottom of each tomato and drop in a large pot of boiling water for 30 to 40 seconds. Drain. Run cold water over tomatoes and drain again. Keep adding and draining water until tomatoes are cool enough to handle. Peel immediately. This sauce can be spooned over any flavor of filled tortellini such as 4 cheese, or is a tasty sauce over any favorite pasta noodle. This sauce is excellent for topping a roasted chicken breast, or as a unique condiment for grilled hamburgers, used in lieu of ketchup.